Looking back, our 100 mile stretch from Pearisburg, Virginia to Daleville, Virginia seemed to be memorable for two reasons: the incredible views and natural wonders we witnessed, and the damage done to our bodies to experience Mother Nature’s beauty. Normally we don’t write about a six day section, but the sights along the way were definitely worthy of a short write-up and a few pictures! First the good before we get into the bad and then the ugly. 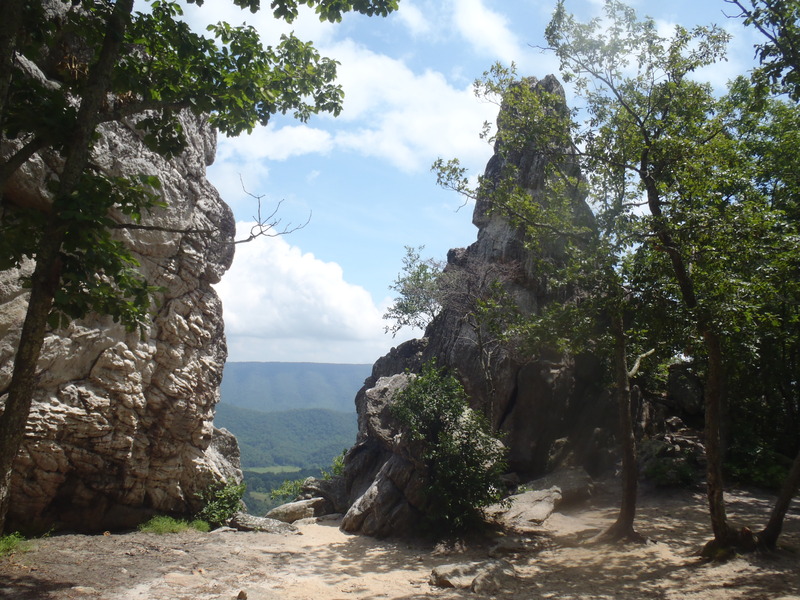 This section of trail crossed over The Dragon’s Tooth, climbed McAfee Knob and traversed the Tinker Cliffs. For me, The Dragon’s Tooth was the hardest and also the most rewarding of the three. Requiring a scramble, at times hand over hand, for a half mile on either side of the viewpoint and taking about three years off my knees on the descent, this overlook was one you had to work for. The work paid off though when we came to the crest of the hill to find two massive slabs of granite, at least 50′ x 30′, that rather than lying flat on the ground stood straight up vertically like a pair of ancient fossilized Dragon’s Teeth. 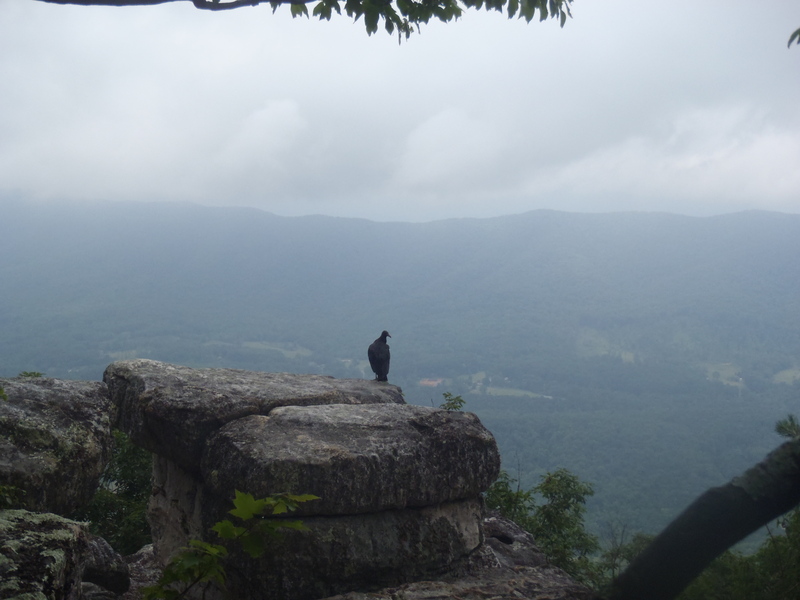 We took the better part of two hours scrambling around on the rocks, watching Hunter jump up and down them with ease and most importantly, enjoying the view of the Central Virginian Appalachians. 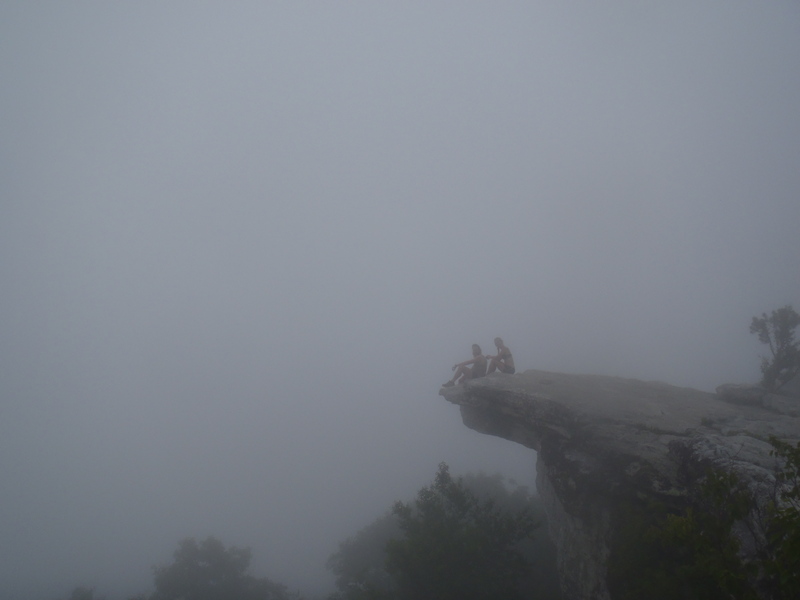 Our following day took us to the (supposedly) most photographed spot on the Appalachian Trail: McAfee Knob, a large granite slab overhang on the side of a mountain. Why is it the most photographed? We couldn’t tell you. 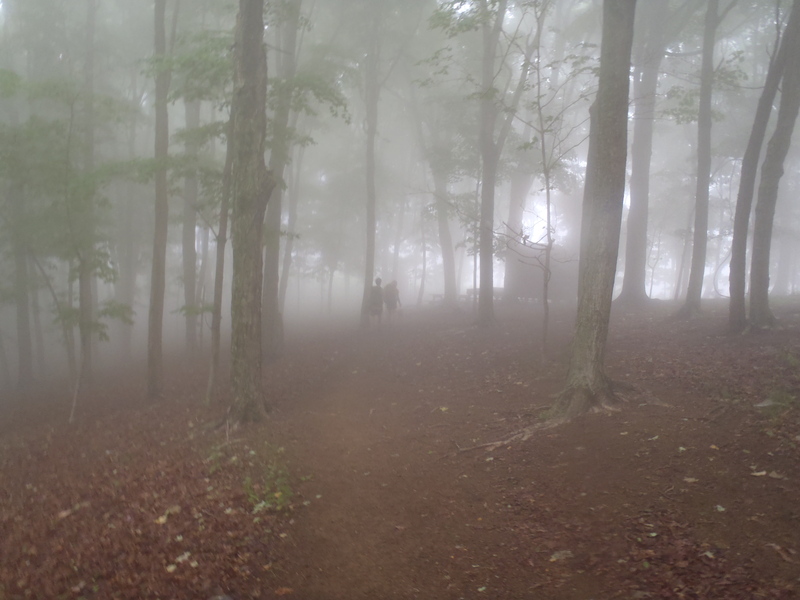 Our morning on the knob was cloudy and misty with about 100′ of visibility. We still took the iconic photo but had to look on Google a few days afterwards to see what we were missing! 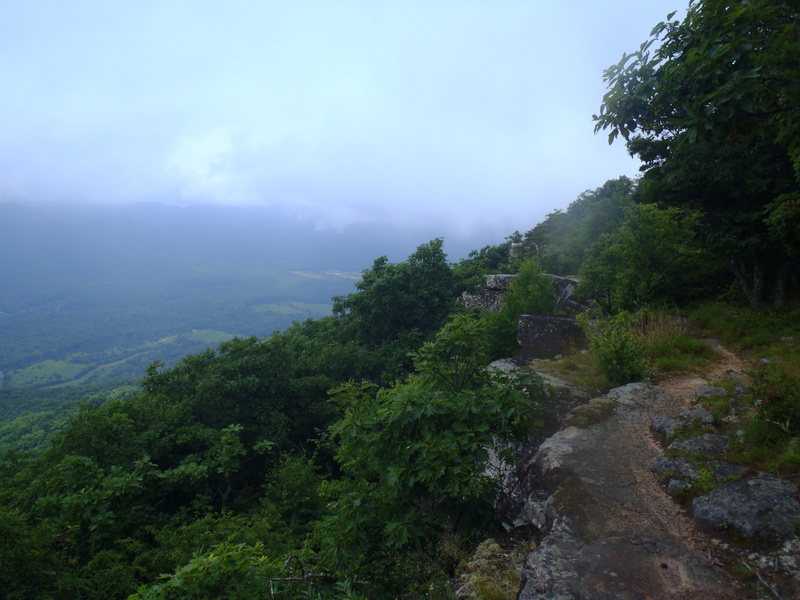 Fortunately, our cloudy morning was replaced by blue skies and a 100 mile view in the afternoon when we hit the Tinker Cliffs. The cliffs, with their Revolutionary War history, were worth another steep climb. For a half mile we strolled within a few feet of a steep hundred foot drop off while picking wild blueberries and getting a fantastic new view around every corner. I know, we have a rough life. The bad in this section would have to be the terrain. Anyone making the statement that Virginia is flat, smooth and easy, is a liar and shouldn’t be trusted! We heard stories of how easy the state would be but we and our fellow AT hikers realized that they were just myths. The trail conditions in this section were not the most difficult or gnarly that we have encountered but expecting easy miles with a nice soft path but walking instead a 10 mile ridge line of pointed rocks turned out to be a mental kick in the teeth! The miles to Daleville took their toll on us and by the time we made it down the last rocky descent we needed an outfitter for new shoes and a day off to rest beat up feet and paws just as much as we needed BBQ and beer! And that’s the ugly of this section, it literally beat us all up pretty badly. Walking out of Pearisburg we felt good and the dog looked strong and very healthy. By the time we made it 30 miles from town Lindsay’s shoes had started to go through a painful breakdown process, Hunter cut the inside of his paw on a sharp rock and the shoes I bought in Damascus turned out to be lemons and were causing me to take off bloody socks at night because they were chaffing so badly. At that point Lindsay and I knew it would be an ibuprofen assisted walk into town as she fought new blisters and foot aches every day and I looked like I walked with a cheese grater on my feet. Hunter on the other hand couldn’t just tough it out, mostly because we couldn’t let him. 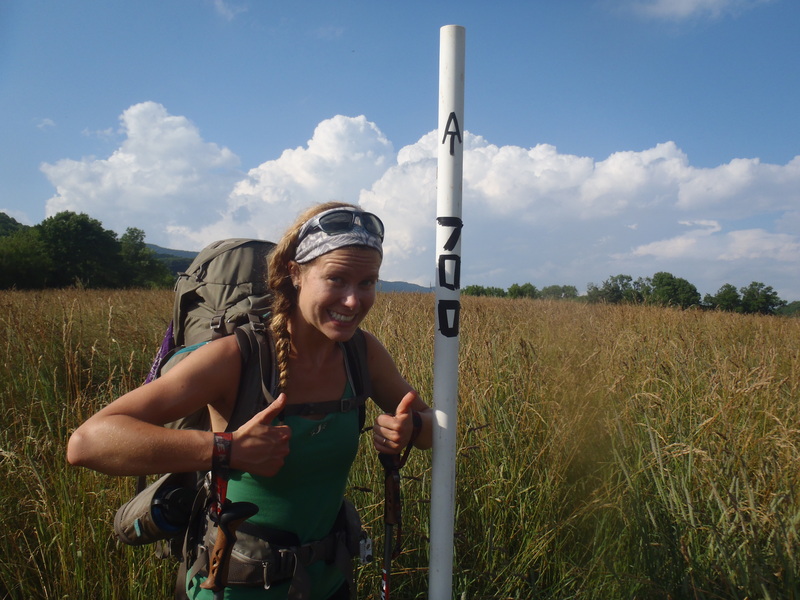 Lindsay celebrating at the 700 mile completed mark! I’m fully convinced he would loyally walk with us through anything until he just tipped over and died, and that is why we have to be careful with him. He came up limping one morning, barely able to put any weight on his left front paw. After a little poking and prodding we found a 1/2″ long gash between two of his pads. He walked through a limp because of his cut paw but with a few days of significantly decreased mileage, no pack to carry and a steady coating of Neosporin he was back to walking like a champ and ready to enjoy a sleepy zero day in Daleville. Rob and I are really enjoying your thoughts and adventures while following the trail! We think of you often and look forward to seeing the last installment at Ktahdin! Blessings to all three of you. Keep us posted. Thanks so much EarthTone, we’re looking forward to getting back to the museum this fall as successful thru hikers! Hey, you two (I guess you three). I’ve been following your posts, and really enjoying the feeling of walking right alongside you all the way. You have no idea how much I miss the trail — I’m already planning next year’s month! Everything else seems secondary. HINT for nutrition on the trail: Have someone mail you freeze dried meals along the trail to supplement your purchases. Freeze dried are not the best for you, but they are way ahead of anything you buy from Dollar General. If you remember, I mailed virtually all of my food ahead. For a thru-hike that would be pretty tough, but it would be a good add-on to your purchases. Steve, thanks so much for checking in on us! If you don’t have a trail name we’ve decided to call you “Trailnivore” because you have such a strict diet at home but on the trail anything is fair game. We’re with you on the mailing ahead plan, if we didn’t have our mail drops from home (we did 12 but should’ve broken them up to about 16 and had less weight dropped each time) we would be having so many more problems finding good food at the little gas stations along the way. When you finally get up to Maine you’ll have to stay in touch and let us know. We can promise you up with a little trail magic in Andover.